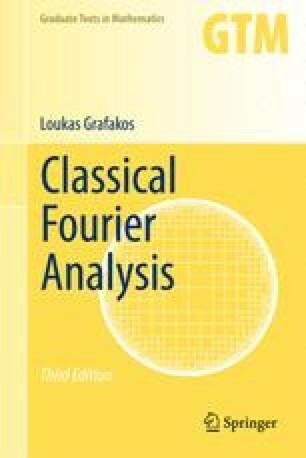 In this chapter we are concerned with orthogonality properties of the Fourier transform. This orthogonality is easily understood on L 2, but at this point it is not clear how it manifests itself on other spaces. Square functions introduce a way to express and quantify orthogonality of the Fourier transform on L p and other function spaces. The introduction of square functions in this setting was pioneered by Littlewood and Paley, and the theory that subsequently developed is named after them. The extent to which Littlewood–Paley theory characterizes function spaces is remarkable.